Pursuant to RSA 206:26 XII, The New Hampshire Fish and Game Department is the agency responsible for conducting search and rescue missions within the woodlands and inland waterways throughout the State of New Hampshire. 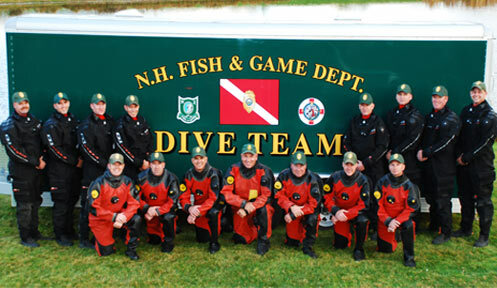 The New Hampshire Fish and Game Dive Team is part of the Law Enforcement Division’s Search and Rescue Program. 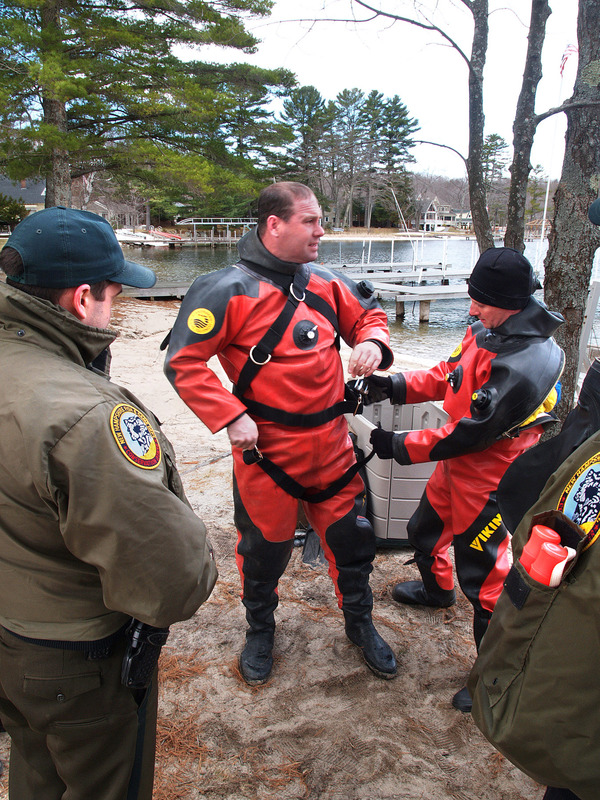 The team consists of 14 specially trained and skilled Conservation Officers who respond to drowning incidents and other diverse calls for dive-related assistance throughout the State of New Hampshire. 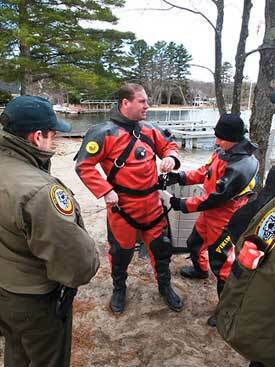 The mission of the team is to recover drowning victims in the state’s inland waterways. In addition, the team assists federal, local, and state law enforcement agencies with search and recovery of submerged evidence in criminal matters. The team also conducts dive operations serving in a homeland security capacity, upon request. Dive Team members must meet specific physical agility testing requirements and continually obtain specialized training related to varied dive missions during all four seasons to include ice diving, current/river dives, and other adverse and hazardous condition diving throughout the year. Members receive annual training for low visibility conditions, evidence retrieval and preservation, safety equipment and techniques, current, saltwater/tidal and wireless communication training. Equipment utilized by divers includes: D1 Hybrid Dry Suits, Exo 26 Full-Face Diving Masks with wireless communication capabilities that provide divers with the ability to communicate with the surface and other divers. The first NH Fish and Game Department diving activities began in the early 1960s. Conservation Officers James Clark and William Mooney were amongst the first divers to make recovery dives. In 1967, theNew Hampshire Fish and Game Law Enforcement Division established the state’s first, and only, recognized dive team. The team was established through the leadership of Conservation Officer Lieutenant Peter B. Lyons and Dive Training Instructor Don Stevens, owner of Atlantic Aquasport in Rye, New Hampshire. The team's mission in those early days mirrored its mission today. Specialized equipment acquired in recent years has improved the team's search capacity. In 2004, the Team acquired a Remotely Operated Vehicle (ROV) through a Homeland Security Grant. This new technology consists of a submersible, remotely propelled video camera that assists in the search for victims and evidence in conditions not conducive to diving. In 2014, through a grant received from the NH Wildlife Heritage Foundation, the Dive Team was able to purchase a dive boat. The new dive boat has greatly enhanced the abilities of the divers to make successful recoveries through the use of advanced electronics and provide a stable platform from which the fivers are able to safely work.